Implementation studies are often poorly reported and indexed, reducing their potential to inform initiatives to improve healthcare services. The Standards for Reporting Implementation Studies (StaRI) initiative aimed to develop guidelines for transparent and accurate reporting of implementation studies. Informed by the findings of a systematic review and a consensus-building e-Delphi exercise, an international working group of implementation science experts discussed and agreed the StaRI Checklist comprising 27 items. It prompts researchers to describe both the implementation strategy (techniques used to promote implementation of an underused evidence-based intervention) and the effectiveness of the intervention that was being implemented. An accompanying Explanation and Elaboration document (published in BMJ Open, doi:10.1136/bmjopen-2016-013318) details each of the items, explains the rationale, and provides examples of good reporting practice. Adoption of StaRI will improve the reporting of implementation studies, potentially facilitating translation of research into practice and improving the health of individuals and populations. Implementation studies are, however, often poorly reported and indexed, making it difficult to find, reproduce, or synthesise the evidence from relevant studies.5 More specific criticisms include poor (or absent) descriptions of conceptual frameworks underpinning the research,5 6 inadequate description of context, and incomplete information about how the intervention was promoted and implemented (or not) in the different settings.6 w6 w7 Similar concerns with, for example, the reporting of randomised controlled trials (RCTs) led to the introduction of the Consolidated Standards of Reporting Trials (CONSORT) checklist,w8 with evidence of subsequent improvement in reporting standards.w9-w11 There have been calls for the development of similar standards for transparent and accurate reporting of implementation studies.5 6 7 The Standards for Reporting Implementation Studies (StaRI) initiative aimed to address this need. 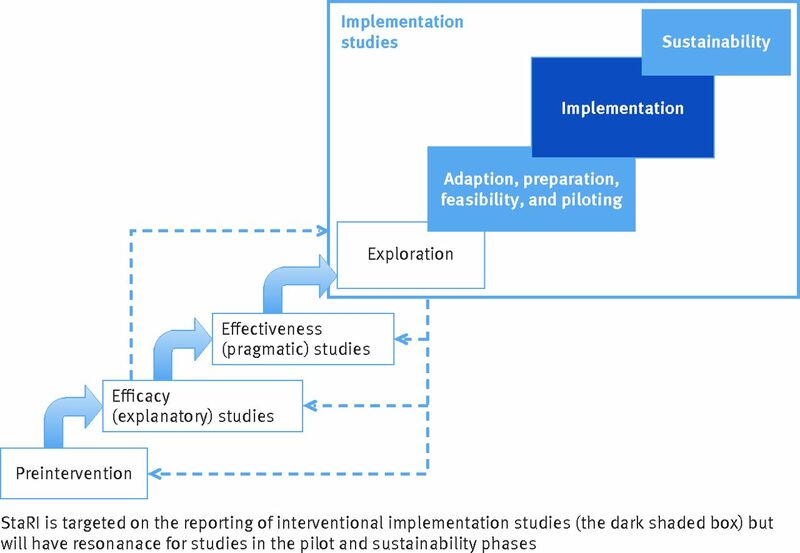 Implementation science encompasses a broad range of methodologies applicable to improving the dissemination, implementation, and scaling up of effective behavioural, clinical, healthcare, public health, global health, and educational interventions8 (or discontinuation of ineffective or harmful practicesw12) with a view to improving quality of care and health outcomes. Although this document is set within the context of healthcare and population health, there are parallels in other domains (such as educational initiatives).9 w13 The StaRI Statement and Checklist may thus have resonance outside healthcare. We followed the methodology described in the Developing Health Research Reporting Guidelines.w21 Our full protocol is available on the EQUATOR website.w22 After a systematic literature review, we recruited international multidisciplinary experts (including healthcare researchers, journal editors, healthcare professionals and managers, methodologists, guideline developers, patient organisations, and funding bodies) to participate in an e-Delphi exercise.17 Of 66 experts approached, 23 contributed suggestions for the Checklist, 20 completed the first scoring round, and 19 completed the second scoring round. Of 47 potential items, 35 reached the a priori level of consensus for inclusion—that is, 80% agreement with priority scores 7, 8, or 9—and 19 items achieved 100% agreement. All these items, with their final priority scores, were taken forward as candidate items for inclusion in the StaRI Checklist. In April 2015, we convened a two-day consensus working group in London attended by 15 international delegates (UK or Europe=11, US or Canada=4) drawn from multiple disciplines. Delegates included healthcare researchers (n=9), journal editors (n=6), healthcare professionals (n=8) and managers (n=1), methodologists (n=4), guideline developers (n=2), and funding bodies (n=2) (several participants had more than one role). This group discussed the candidate items and agreed the first draft of the StaRI Checklist. The discussions were informed by the outcome of the e-Delphi exercise (see appendix 1 for the e-Delphi results as provided to the workshop delegates), but items were also considered in the context of other published reporting standards and the wider literature, and the working group’s expertise in implementation science. After general discussion on key defining concepts (informed by points raised in the e-Delphi17), each candidate item was considered in turn. Agreement was reached by discussion rather than by consensus scoring. The initial draft statement and documents were subsequently developed iteratively by email discussion. Constructive feedback on a penultimate draft of the StaRI Statement from colleagues working internationally in the field of implementation science, healthcare researchers, clinicians, and patients was used to help shape the final version of the paper. In addition, we presented the concepts to and sought feedback from several workshops, conference discussions, and implementation project steering groups. There are two defining concepts underpinning the StaRI Statement and Checklist. The first is the dual strands of describing, on the one hand, the implementation strategy and, on the other, the clinical, healthcare, global health, or public health intervention being implemented.3 w23 For example, an implementation strategy (staff training, changes to invitation letters and appointment systems, development of computer templates, ongoing audit, etc) might support an intervention (such as offering the option of telephone consultations) with the aim of improving access to routine asthma care.w24 These strands are represented as two columns in the Checklist (see table 1⇓). The primary focus of implementation science is the implementation strategy,w25 and the expectation is that the items in column 1 will always be fully completed with details of how the intervention was implemented and the impact measured as an implementation outcome. The second strand (column 2) expects authors to complete items about the impact of the intervention on the health of the target population. This may be measured as a health outcome, or it may be more appropriate to cite robust evidence to support known beneficial effects of the intervention on health of individuals or populations (such as reducing smoking prevalence). Even when evidence is strong, the possibility that the impact of an intervention may be attenuated when it is implemented in routine practice needs to be considered. Although all items are worthy of consideration, not all items will be applicable to, or feasible in, every study; a fully completed StaRI Checklist may thus include a number of “not applicable” items. The StaRI Checklist comprises 27 items, of which 10 items expect authors to consider the dual strands of the implementation strategy and the intervention (see table 1⇑). Details about each of the Checklist items is provided in the accompanying Explanation and Elaboration document published in BMJ Open.18 Appendix 2 is a version of the Checklist for completion by authors submitting an implementation paper. It is strongly recommended that authors using the StaRI Checklist read the detailed document that explains the rationale for each item and provides examples of good practice. The expectation is that authors have an explicit hypothesis (we use the term “logic pathway”) that spans both how the implementation strategy is expected to work and the mechanism by which the intervention is expected to improve healthcare (see Explanation and Elaboration document18 for a table of alternative terminologies and a link to a detailed description of “logic models”). This logic pathway should reflect the rationale presented in the introduction, determine the approach to implementation, dictate implementation, health, and process outcomes, and provide insights into why and how the implementation strategy and intervention worked (or not). We hope that the concept of dual strands will resonate with researchers designing and reporting implementation science studies. We appreciate that the distinction will not always be as unambiguous as it seems in the StaRI checklist, but we suggest that considering the design and evaluation of implementation studies in these two strands is helpful and aids clarity of study design and reporting. We also recognise that not all studies will measure health outcomes, though consideration of the ultimate goal of improving health through implementing an evidence-based intervention would seem a reasonable requirement. Feedback on this underpinning concept will be valuable for future iterations of the StaRI Statement and Checklist. There are two practical challenges for the application of StaRI that warrant discussion. First, implementation science uses diverse methodologies that need to be accommodated in the reporting standards. One option is to incorporate relevant items from other checklists, but this may be perceived as limiting the methodological options. StaRI therefore advises authors to consult methodological checklists for reporting design-specific aspects of their chosen study design. By doing this, we have implicitly prioritised the concept underpinning implementation studies, though this should not be interpreted as undermining the rigour of reporting the chosen study design. The second challenge is the requirement for extensive description of context, implementation strategies, and interventions as well as reporting a broad range of primary effectiveness, process, health, economic, and implementation outcomes.w25 This requirement will stimulate debate about word counts, supplementary material, and additional publications in order to accommodate journal requirements, author needs, and reader preferences. This tension is further discussed in the Explanation and Elaboration document,18 and some practical approaches are suggested for summarising information in tables or figures. We look forward to learning how authors and journals work with these challenges and the (innovative) solutions that they adopt (such as appendices, supplementary online files, and additional publications). The StaRI Statement is registered with the EQUATOR Network (www.equator-network.org), and the Checklist (for completion by authors) is freely available from bmj.com (appendix 2). We invite editors of all journals publishing implementation research to consider requiring submission of a StaRI Checklist, and authors reporting their implementation studies to use the Checklist. In the future we would like to work with authors as they apply the Checklist to their papers, “road testing” the standards and enabling iterative development. Previously published reporting guidelines have been instrumental in improving reporting standards,6 w8-w10 and our hope is that StaRI will achieve a similar improvement in the reporting of implementation strategies that will facilitate translation of effective interventions into routine practice, ultimately to benefit the health of individuals and populations. Members of the the StaRI Group are: Melanie Barwick, Chris Carpenter, Peter Craig, Sandra Eldridge, Eleni Epiphaniou, Gonzalo Grandes Odriozola, Chris Griffiths, Martin Gulliford, Jo Rycroft-Malone, Paul Meissner, Brian Mittman, Elizabeth Murray, Anita Patel, Gemma Pearce, Hilary Pinnock, Aziz Sheikh, and Steph Taylor. Members of the PRISMS team (Eleni Epiphaniou, Gemma Pearce, and Hannah Parke) supported the underpinning literature work, and the e-Delphi exercise was handled by ClinVivo. We thank colleagues (implementation science experts, healthcare researchers, clinicians, PhD students) who reviewed the penultimate draft of the StaRI statement and provided a reality check and constructive feedback: Helen Ashdown, David Chambers, Louise Craig, Clarisse Dibao-Dina, Peter Hanlon, Roger Jones, Rachel Jordan, Chris del Mar, Brian McKinstry, Susan Morrow, John Ovretveit, David Price, Kamran Siddiqui, Rafael Stelmach, Paul Stephenson, Shaun Treweek, Bryan Weiner. We also thank Melissa Goodbourn and Allison Worth, who arranged feedback from the Edinburgh Clinical Research Facility Patient Advisory Panel (Stephanie Ashby, Alison Williams), and Steven Towndrow who coordinated feedback from the Patient and Public Involvement representatives of the NIHR CLAHRC North Thames (Ben Wills-Eve, Rahila Bashir, Julian Ashton, Colleen Ewart, Karen Williams). Contributors: HP initiated the idea for the study and with ST led the development of the protocol, securing of funding, study administration, workshop, and writing of the paper. AS, CG, and SE advised on the development of the protocol and data analysis. All authors participated in the StaRI international working group along with GP, BM, MG. HP wrote the initial draft of the paper, to which all the authors contributed. HP is the study guarantor. Funding: The StaRI initiative and workshop were funded by contributions from the Asthma UK Centre for Applied Research (AC-2012-01); Chief Scientist Office, Scottish Government Health and Social Care Directorates (PCRCA_08_01); the Centre for Primary Care and Public Health, Queen Mary University of London; and with contributions in kind from the PRISMS team (NIHR HS&DR Grant 11/1014/04). ST was (in part) supported by the National Institute for Health Research (NIHR) Collaboration for Leadership in Applied Health Research and Care (CLAHRC) North Thames at Bart’s Health NHS Trust. AS is supported by the Farr Institute. The funding bodies had no role in the design, in the collection, analysis, and interpretation of data; in the writing of the manuscript; nor in the decision to submit the manuscript for publication. Competing interests: All authors have completed the ICMJE uniform disclosure form at www.icmje.org/coi_disclosure.pdf and declare: research grants from Chief Scientist Office (HP), Asthma UK (AS, HP, ST), Farr Institute (AS), NIHR HS&DR (HP, ST), NIHR CLAHRC (ST) for the submitted work; no financial relationships with any organisations that might have an interest in the submitted work in the previous three years; CC is deputy editor-in-chief for Academic Emergency Medicine and on the editorial boards for the Journal of the American Geriatrics Society and Annals of Internal Medicine's ACP Journal Club and serves as paid faculty for Emergency Medical Abstracts, JR-M is director of the NIHR HS&DR Programme, no other relationships or activities that could appear to have influenced the submitted work. Disclaimers: The views expressed are those of the authors and not necessarily those of the NHS, the NIHR, or the Department of Health. Provenance of the paper: The StaRI Checklist was informed by the findings of a literature review and an e-Delphi exercise, an international consensus workshop, and the subsequent email correspondence among members of the StaRI Group. The international authors contributed expertise on clinical practice, public health, knowledge exchange, implementation science, complex interventions, and a range of methodologies including quantitative and qualitative evaluations. Chalkidou K, Anderson G. Comparative Effectiveness Research: International Experiences and Implications for the United States.www.nihcm.org/pdf/CER_International_Experience_09.pdf. Damschroder LJ, Aron DC, Keith RE, Kirsh SR, Alexander JA, Lowery JC. Fostering implementation of health services research findings into practice: a consolidated framework for advancing implementation science. Implement Sci2009;4:50. doi:10.1186/1748-5908-4-50 pmid:19664226. Peters DH, Adam T, Alonge O, Agyepong IA, Tran N. Implementation research: what it is and how to do it. BMJ2013;347:f6753.pmid:24259324. Foy R, Sales A, Wensing M, et al. Implementation science: a reappraisal of our journal mission and scope. Implement Sci2015;10:51. doi:10.1186/s13012-015-0240-2 pmid:25928695. Pinnock H, Epiphaniou E, Pearce G, et al. Implementing supported self-management for asthma: a systematic review and suggested hierarchy of evidence of implementation studies. BMC Med2015;13:127. doi:10.1186/s12916-015-0361-0 pmid:26032941. Rycroft-Malone J, Burton CR. Is it time for standards for reporting on research about implementation?Worldviews Evid Based Nurs2011;8:189-90. doi:10.1111/j.1741-6787.2011.00232.x pmid:22123028. Neta G, Glasgow RE, Carpenter CR, et al. A Framework for Enhancing the Value of Research for Dissemination and Implementation. Am J Public Health2015;105:49-57. doi:10.2105/AJPH.2014.302206 pmid:25393182. Brownson RC, Colditz GA, Proctor EK, eds. Dissemination and implementation research in health: translating science into practice.Oxford University Press, 2012doi:10.1093/acprof:oso/9780199751877.001.0001. Barwick M, Barac R, Akrong LM, Johnson S, Chaban P. Bringing evidence to the classroom: exploring educator notions of evidence and preferences for practice change. Int J Educ Res2014;2:1-15doi:10.12735/ier.v2i4p01. Craig P, Dieppe P, Macintyre S, Michie S, Nazareth I, Petticrew M. Developing and evaluating complex interventions: the new Medical Research Council guidance. MRC, 2008. mrc.ac.uk/complexinterventionsguidance. Loudon K, Treweek S, Sullivan F, Donnan P, Thorpe KE, Zwarenstein M. The PRECIS-2 tool: designing trials that are fit for purpose. BMJ2015;350:h2147. doi:10.1136/bmj.h2147 pmid:25956159. Greenhalgh T, Robert G, Macfarlane F, Bate P, Kyriakidou O. Diffusion of innovations in service organizations: systematic review and recommendations. Milbank Q2004;82:581-629. doi:10.1111/j.0887-378X.2004.00325.x pmid:15595944. Pinnock H, Epiphaniou E, Taylor SJC. Phase IV implementation studies. The forgotten finale to the complex intervention methodology framework. Ann Am Thorac Soc2014;11(Suppl 2):S118-22. doi:10.1513/AnnalsATS.201308-259RM pmid:24559024. Lansdverk J, Brown CH, Chamberlain P, et al. Chapter 12: Design and analysis in dissemination and implementation research. In: Brownson RC, Colditz GA, Proctor EK, eds. Dissemination and implementation research in health: translating science into practice. Oxford University Press, 2012. Curran GM, Bauer M, Mittman B, Pyne JM, Stetler C. Effectiveness-implementation hybrid designs: combining elements of clinical effectiveness and implementation research to enhance public health impact. Med Care2012;50:217-26. doi:10.1097/MLR.0b013e3182408812 pmid:22310560. Bauer MS, Damschroder L, Hagedorn H, Smith J, Kilbourne AM. An introduction to implementation science for the non-specialist. BMC Psychol2015;3:32. doi:10.1186/s40359-015-0089-9 pmid:26376626. Pinnock H, Epiphaniou E, Sheikh A, et al. Developing standards for reporting implementation studies of complex interventions (StaRI): a systematic review and e-Delphi. Implement Sci2015;10:42. doi:10.1186/s13012-015-0235-z pmid:25888928. Pinnock H, Barwick M, Carpenter CR, et al. for the StaRI Group. Standards for Reporting Implementation Studies (StaRI): Explanation and Elaboration document. BMJ Open2017doi:10.1136/bmjopen-2016-013318. Hawe P, Shiell A, Riley T. Complex interventions: how “out of control” can a randomised controlled trial be?BMJ2004;328:1561-3. doi:10.1136/bmj.328.7455.1561 pmid:15217878. Rycroft-Malone J, Seers K, Chandler J, et al. The role of evidence, context, and facilitation in an implementation trial: implications for the development of the PARIHS framework. Implement Sci2013;8:28. doi:10.1186/1748-5908-8-28 pmid:23497438.